WC’s Bird of the Week feature is reaching the end of WC’s photo list of Alaska birds.1 Three of the next four birds are Eurasian species that WC was lucky enough to photograph. 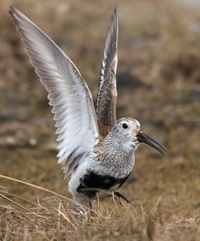 The first is a Terek’s Sandpiper, which appeared in Anchorage a couple of years ago. Note the distinctive long, up-turned bill on this species. You can’t see if clearly in this photo but the legs are yellow-orange. Terek’s are a Eurasian species, “casual” in Alaska, a birding term that means you see them once in a blue moon. As you might imagine, there were hordes of birders on this lost little avian. If WC had tried to get closer for a better shot, he would have been lynched. WC isn’t a “chaser,” at least much beyond a radius of 10-15 miles. WC was in Anchorage for business, en route to Homer. It was pure, dumb luck WC saw and photographed this bird at all.